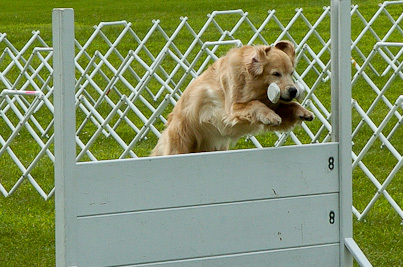 The sport of canine obedience is a unique discipline in the canine world. All forms of dog training require teamwork, but no other is as precise as heeling in the obedience ring. It demonstrates teamwork akin to dancing and can be matched by nothing else. Every move you make, from an about turn to a slight shift in your eyes, is reflected in the eyes and subtle movement of your dancing partner, your dog. The overall relationship you have with your partner will determine your success. You can qualify by knowing the steps, but when it's done right, people will stop, smile and watch in amazement. Such teamwork is a reflection of the relationship between dog and handler, far surpassing mere obedience. 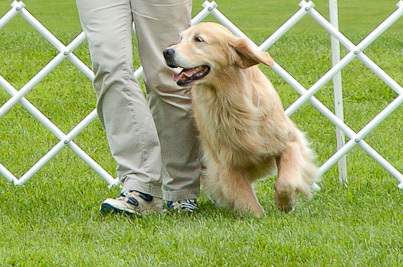 Yankee holds an AKC-licensed obedience trial and rally trial in conjunction with its spring independent specialty show (Golden Retrievers only). The club occasionally offers matches, run-thrus, and training parties for all levels of competition. 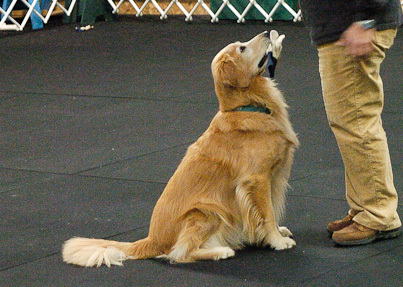 Obedience competition was developed to promote better canine citizenship, and the exercises were derived from what was taught to war canines, especially during WWII. The exercises for each level of obedience have a use in everyday life. 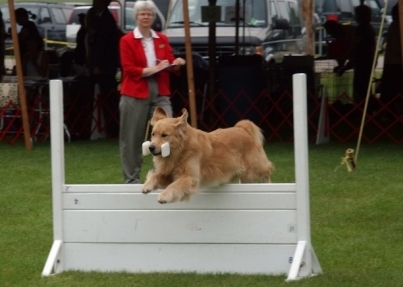 To attain an obedience title, the dog and handler must successfully complete the routine for that level three times, under three different judges. Each successful attempt is called a "leg." Three "legs" equals a title. The titles must be earned in ascending order; the Novice (CD) title must have been won before the dog may compete in the Open (CDX) class and the CDX title must have been won before the dog may compete in Utility (UD). In the Novice class, all heeling is done on-lead. Other exercises include a "Stand for Examination", a "Recall" and "Long Sit" and "Long Down" exercises. 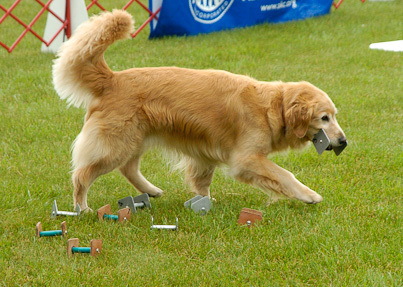 The Novice A class is for inexperienced handlers and dogs. The advanced levels, Open and Utility, add off-lead work, hand signals, jumping, retrieving, directional commands and scent discrimination. The titles awarded demonstrate the goals of obedience: Companion Dog, Companion Dog Excellent, Utility Dog, Utility Dog Excellent, and Obedience Trial Champion. 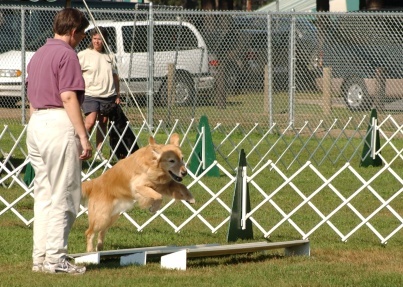 In Rally, the dog and handler team move continuously through a course designed by the judge. There is a sign at each station indicating the exericse to be performed. 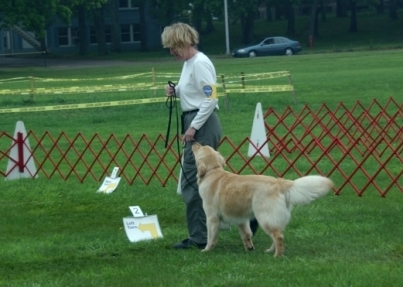 The handler may encourage the dog while completing 10 to 20 designated stations. Rally titles include: Rally Novice, Rally Advanced, Rally Excellent, and Rally Advanced Excellent.